Let circus stretch your muscles and imagination! From juggling to acro-balance, plate spinning to hula, trapeze to tight wire, we have a workshop for you. 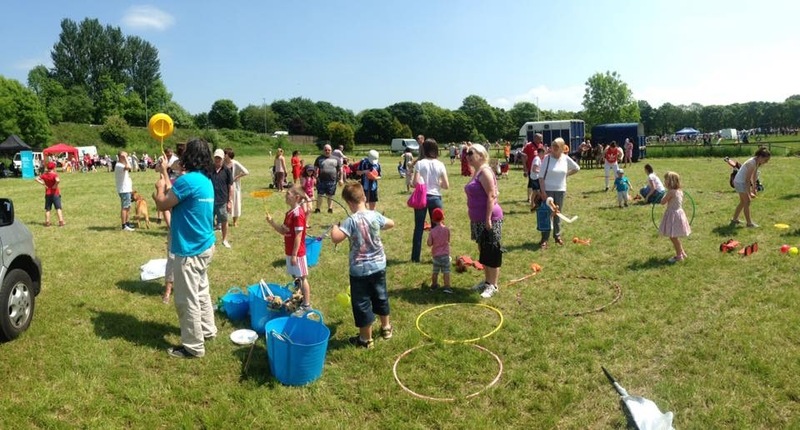 Juggling, Spinning Plates, Flower Sticks (devil sticks), Diabolo, Poi, Club-swinging, Hula hoop, Unicycling, Balances, Pyramids, Tightwire and Stilt-walking. Taster 1-2 hours is popular for about 30 participants (a class). For other groups the usual number of participants is 25. Easily achievable skills like feather-balancing are taught to the whole group first. Success breeds success! Trainers give an entertaining demonstration of the remaining skills and participants either choose which to concentrate on or are divided into groups that move round activities. Full day of Tasters in schools Often a school wants most pupils, to either take part or benefit as audience. 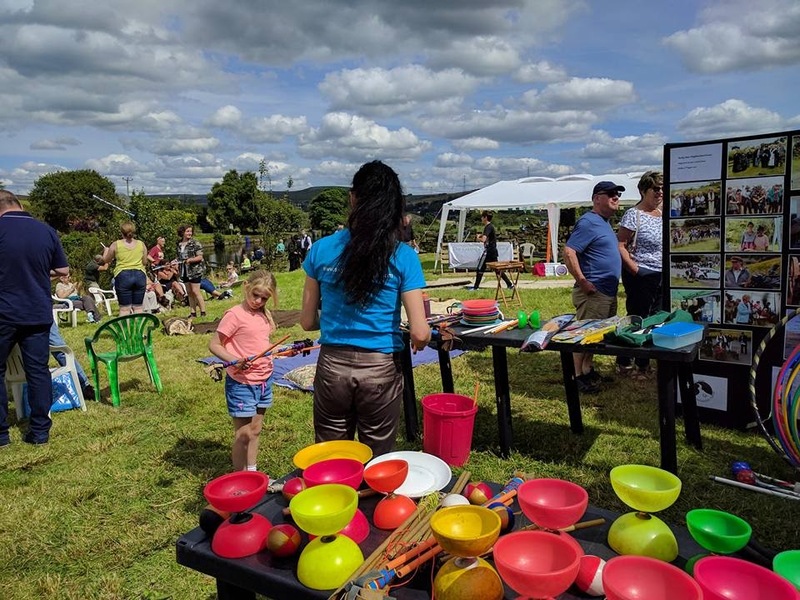 Up to five one-hour workshops are possible, with a class in each, mostly learning ‘handheld’ equipment such as spinning plates, juggling, diabolo, flower sticks. A short performance by our trainers or even a Circus Show – an entertaining mix of stunning circus skills, clowning and illusions – suitable for a whole primary school – may sometimes be programmed. Brownies and Cubs Circus Badge Workshop. Badges can be achieved in a 1.5 hr workshop. If group size is no more than 15, it may be possible to have just one trainer, to save expense. Family Workshops. The aim of these taster sessions is for parents, carers and children to work together and to see one another in a new light. 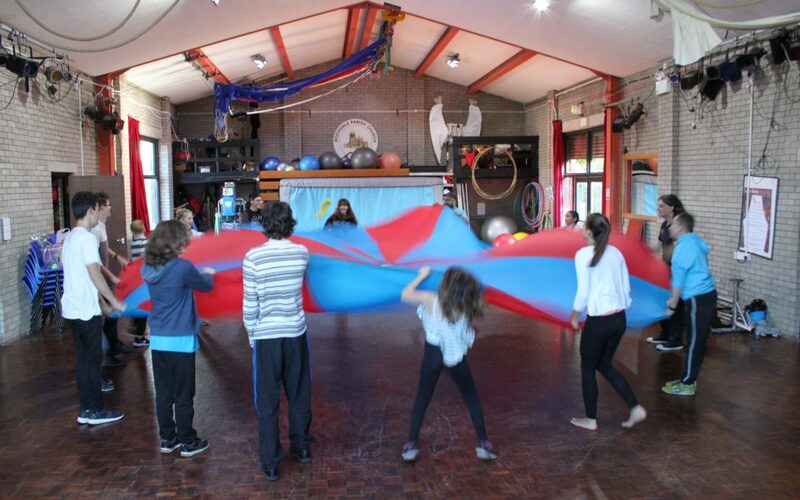 Group and parachute games are great for encouraging the generations to cooperate. Full day with one Group/Class. More skills can now be included e.g. 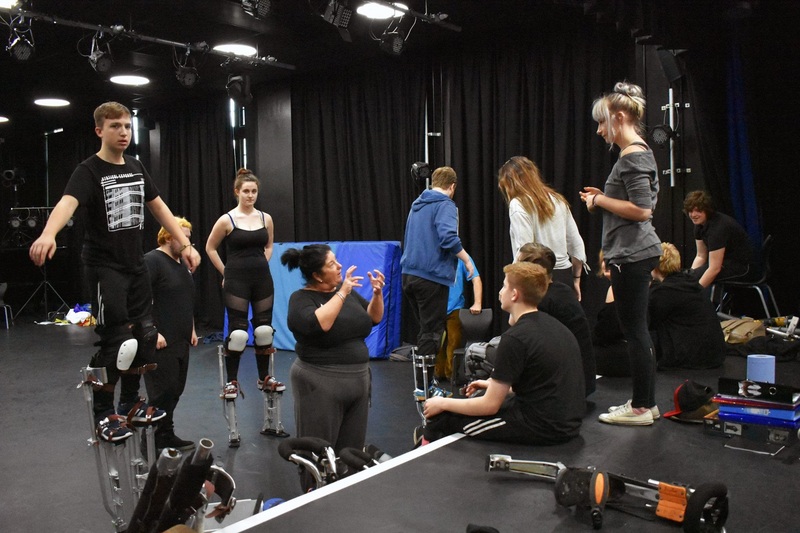 tightwire, stilt-walking or unicycles and pyramids… and the group can perform skills at the end of the session, either to each other or an informal audience e.g. family or colleagues. Specific Skill workshops (Custom made) Sometimes a session will be for only one or two skills. We can bring several tightropes/wires, or sets of stilts. 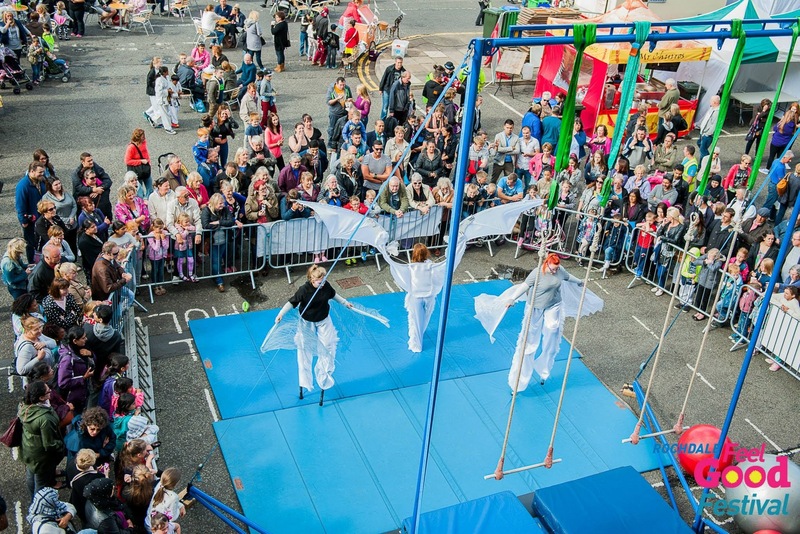 We can bring a small aerial rig so your group can experience the thrills of trapeze – max 8 participants, or 12 if two aerial trainers..
Nursery Show and Have-a-go is for the youngest children, 3-5 yr olds. Workshops and disability Skylight is experienced in the effective use of circus equipment (some made specifically) with people with a wide range of disability and learning difficulties, including people with complex needs. 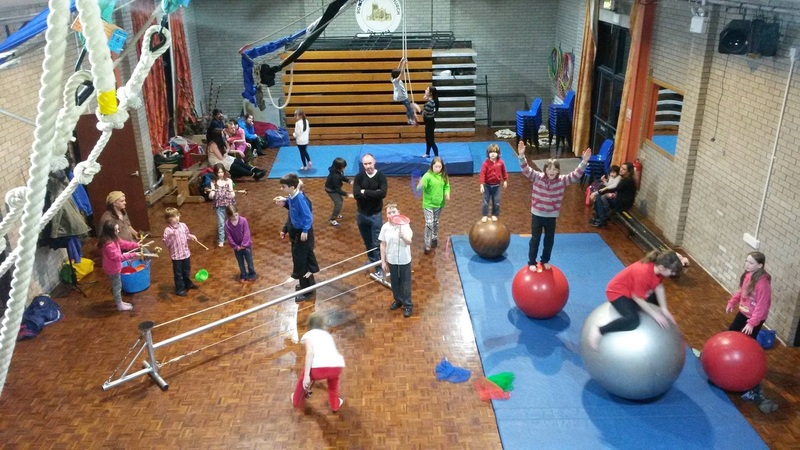 We come to you or if you want an exciting visit to a circus school, Skylight is fully accessible with toilet, hoist and changing facilities. Activities are tailored to individuals so everyone is included. Tactile, sensory experiences as simple as floating juggling scarfs get a response from someone with little mobility or language, whereas some young people who lack the confidence to take on challenges are thrilled to achieve skills in manipulative equipment like juggling, flower sticks or diabolo. If participants come to Skylight we have our aerial harness and swings. There will be more one-to-one interactions necessary in these workshops so the ratio of trainers to participants is high. The group size is usually between 6-12, depending on the needs of participants. School And The Community Winter Warmer DISCOUNT OFFER.